With an America in economic recovery, Sears expanded their line of door chimes for the new decade. The 1940 Spring catalog featured a complete line of Door Chimes, including their first ever Long Bell Door Chime in a Big Book catalog. The line also included a stylish triangular single note chime from Mello Chime, a Compact Nutone and a Nutone branded resonator. 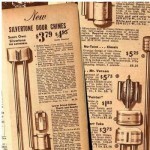 The 1940 catalogs cemented a Sears-Nutone relationship that would continue until 1960. The Fall of 1941 was especially notable as Sears introduced their own “Silvertone” brand of door chimes. The Silvertone line included the “Cathedral” long bell door chime, and two smaller two note chimes that were re-branded Nutone products. Then, as today, Sears’ value proposition offered house brands that compared favorably in features at a lower price point than competing products. Consequently, the Silvertone Chimes were featured higher on the page, and with lower prices then the selection of four Nutone Chimes found lower on the page. The nation’s entry into World War Two immediately altered the manufacture and sale of consumer goods, including door chimes. Materials, from brass to the very paper on which the Sears Catalogs were printed were classified as essential war materials. During the War, most consumer goods manufacturers busied themselves building products essential to the war effort. The Lionel Toy Train Company famously made telegraphs, and Nutone manufactured military ordinance while Rittenhouse manufactured aircraft radios. Except for perhaps the bad pun, it’s safe to say the Door Chime industry was toned down for the duration of the war. One can only speculate what might have developed fromn 1941 to 1945 in the Doorbell industry had there not been a war. What is certain is that Sear’s application of the Silvertone brand for Door Chimes was short-lived, as it did not reappear following the War. Sear’s would once again market their own line of chimes under their Harmony House Brand beginning in 1959. The Silvertone brand was introduced by Sears in 1915 for hand cranked phonographs. Over the years, the brand was extended to radios, radio equipment and musical instruments. The brand is most often associated with a successful line of electric guitars. 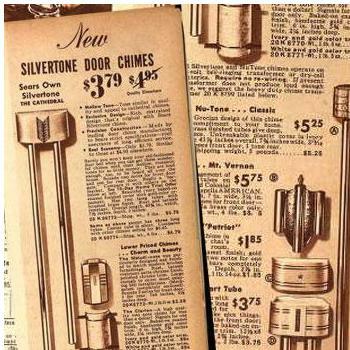 Extending the Silvertone brand to Sears' line of Door Chimes was a natural since door chimes are an electric musical instrument with a limited repertoire.